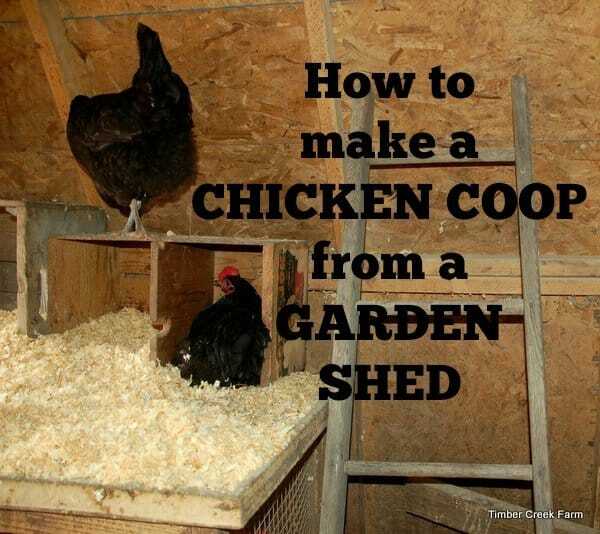 Make a Chicken Coop from a Garden Shed! 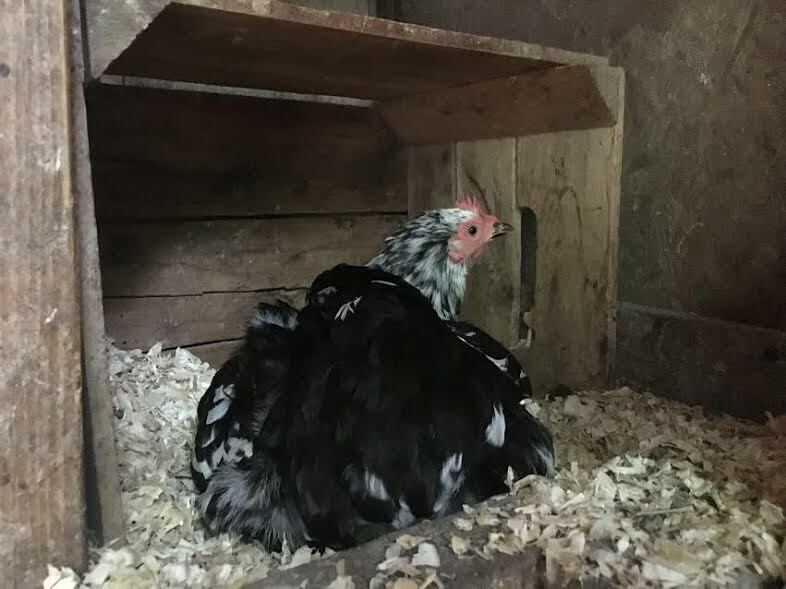 The day I brought home the first two chicks, I went against all the advice I give to people thinking about getting chickens. 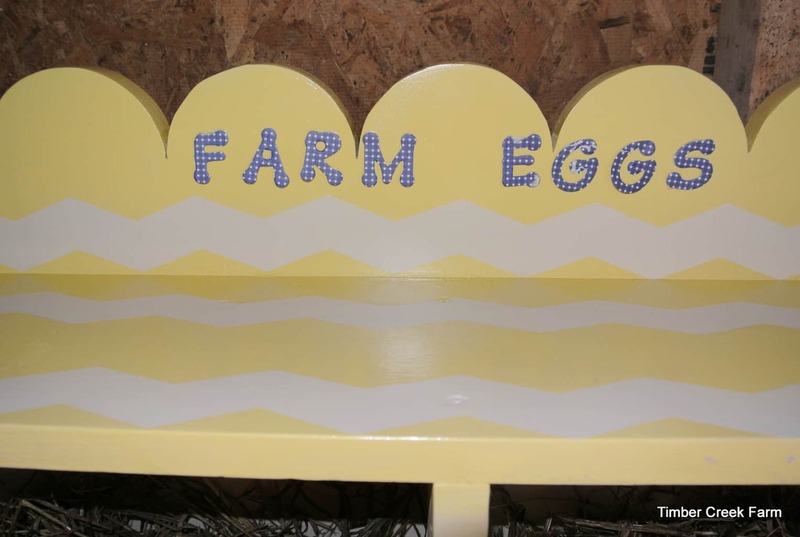 We had a farm but had no chicken coop or really any plan to build one. But two chicks followed me home from work at a feed store and the future was changed forever. Not long after, twelve more chicks arrived to keep the first two chicks company. We now had fourteen baby chicks growing up in our house but they could not stay there forever. It was very clear that in the near future we were going to need a chicken coop on the farm. We had two garden sheds in our yard. Downsizing was in order because having two sheds just meant that you saved and held onto twice as much “stuff”. 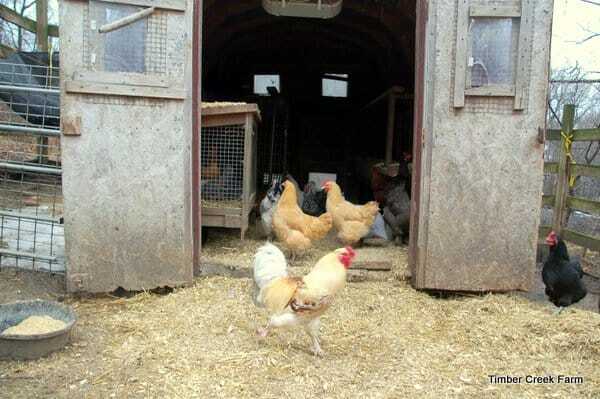 We would use one of the sheds for a coop but first it needed to be emptied and then moved to the barn area. 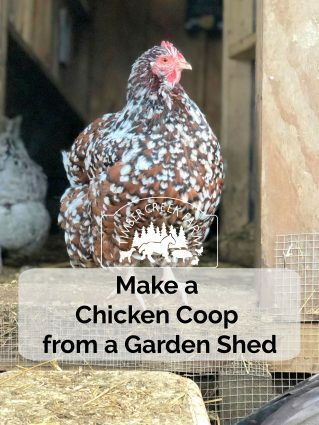 The first step in converting the shed into a coop happens before the shed even arrives. 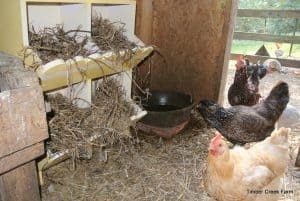 Level the ground and get materials for elevating the coop off the ground several inches. 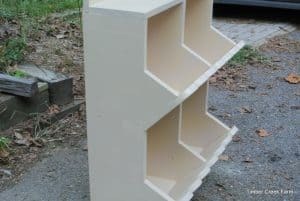 You could use 6 x 6 timbers or cinder blocks. We opted to go with the treated lumber 6 x 6 timbers to raise the coop up from ground level. 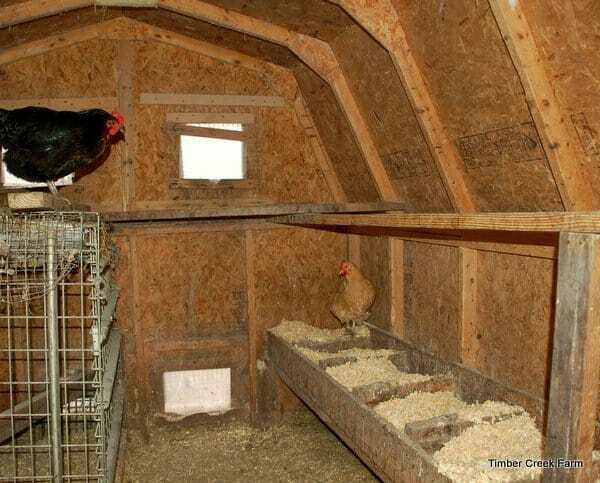 There are two main reasons to do this, one is to allow drainage and air flow under the coop and prohibit rotting. 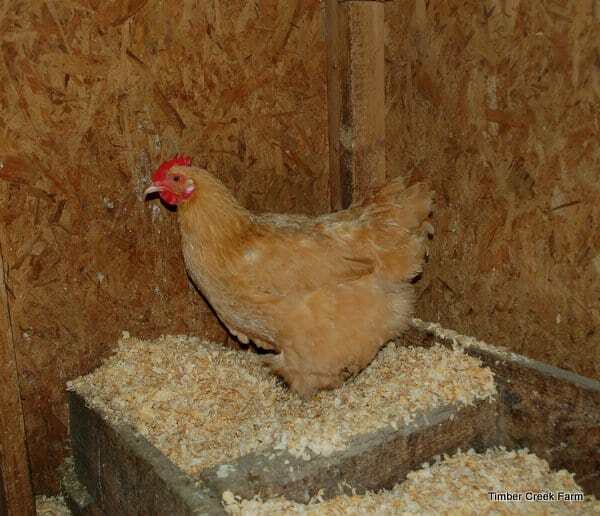 The second reason is to deter predators and pests from chewing into the coop from the ground. Inside the coop we spread a layer of cement and let it cure for a couple of days to dry completely. This also deterred rodents from chewing into the coop from the ground level. Once that prep work is complete it is time to retrofit the shed and turn it into a coop. Some things you will need to add are listed below. 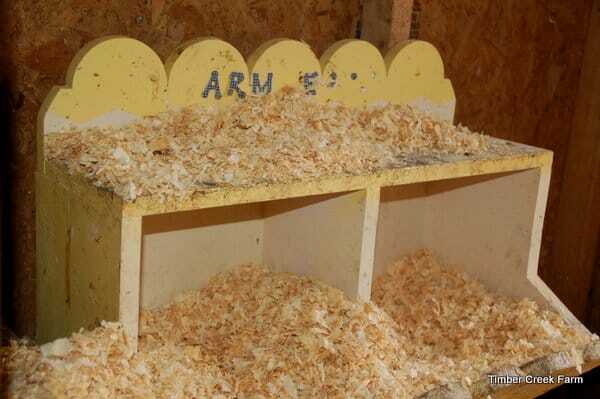 Roosting bar /Roosting area– Many people use a 2 x 4 board as a roost. This should be turned so that the 4 inch side is flat for the chickens to perch on and comfortably cover their own feet with their feathers during cold weather. 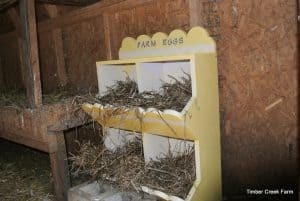 Nesting Boxes– There are many formulas on calculating how many nest boxes for the number of hens in the coop. I will tell you that no matter how many nest boxes you have, all the hens will wait in line for the same box. Sometimes a few will crowd into one nest area. 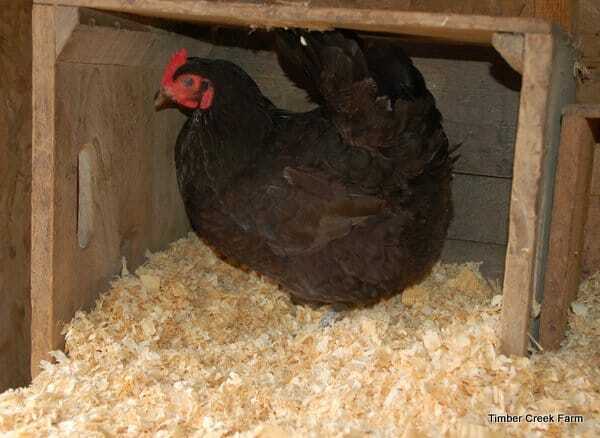 I recommend having a few nest boxes in the coop but don’t be surprised if one nest box becomes the popular nest. Windows– Our shed did not have any windows in it. Before we could use it for a coop we added four windows in the back and two windows in the door. This allowed cross ventilation, and daylight to enter the coop. 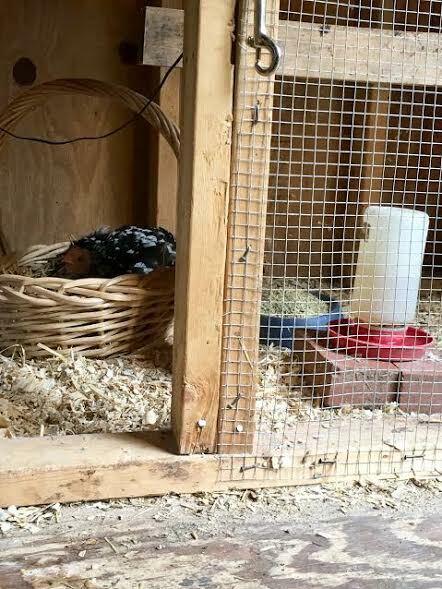 Since chicken wire will not keep predators out, be sure to securely fasten quarter inch hardware cloth to any windows or ventilation holes you cut into the coop. Exterior latches– We added a couple extra latches in addition to the door handle. We have a wooded property and the racoons are literally everywhere. Racoons have a lot of dexterity in their paws and can open doors and latches. So we have a secure lock down situation for our chickens! 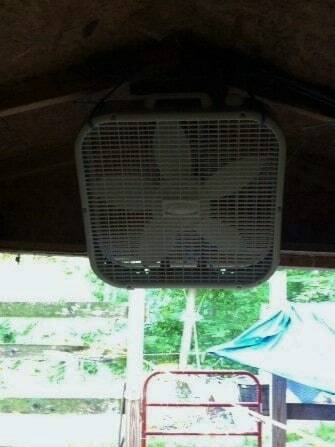 A fan– Hanging a box fan will keep the chickens more comfortable and help with air circulation during the hot humid summer days and nights. We hang ours from the ceiling pointing towards the back windows. It makes a big difference. Be sure to keep the fan clean because dust will build up quickly from being used in the coop, which can become a fire hazard. Don’t Forget Regular Upkeep Inspections! 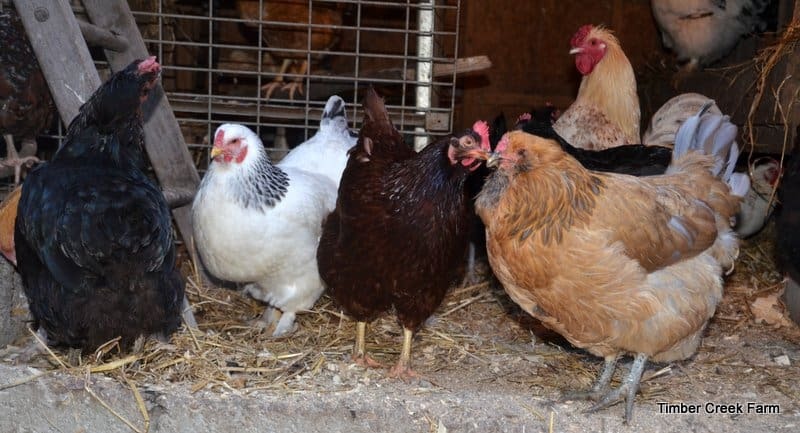 After building the perfect chicken coop from a garden shed, remember that upkeep is needed. Doing routine inspections, and repairs as outlined here, will help you get many years of wear out of the coop. 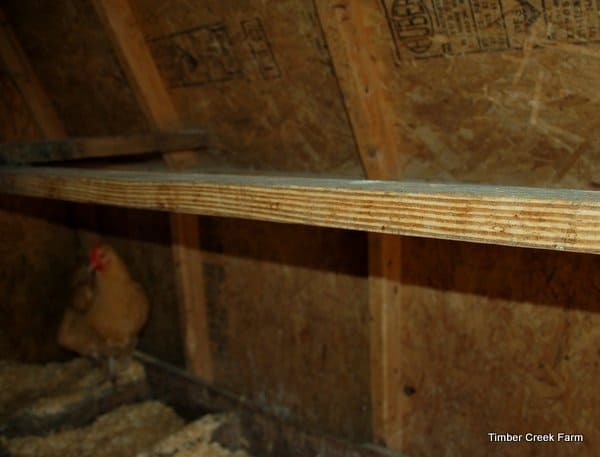 Droppings board– When this coop was first used, I didn’t know the importance of a dropping board under the roost bar. Stinky droppings accumulated under where the birds roosted at night, attracted flies and the chickens walked in the droppings! Ick! The dropping board was very easily added and made a huge difference in keeping the coop clean and free of flies. You can read more specifically about our coop dropping boards in this post. 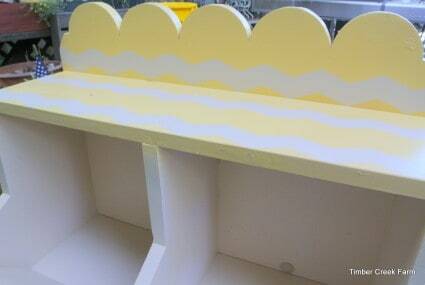 Basically, the board is installed under the roost bar and is removed to clean the droppings off of it. If the board is attached you would use something like a garden trowel or cat litter scoop to clean up the droppings and remove them to the compost pile. Our coop is not fancy. No frilly curtains, or interior paint. I did paint the one nesting box in a very cute pattern and added lettering that stated “Farm Eggs”. 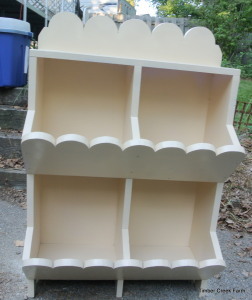 The girls still pooped all over it and decided to peck the lettering off of the top. 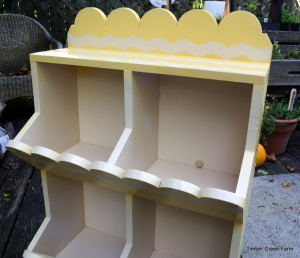 I still think it would be fun to paint the inside and add some wall art. I’ll add that to this Spring’s To Do List! 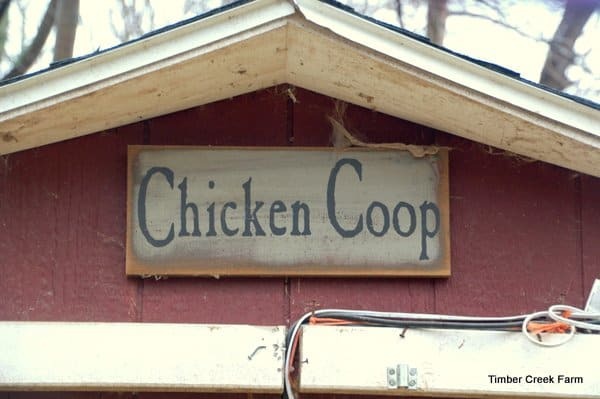 I hope you enjoy this short video tour of our chicken coop! 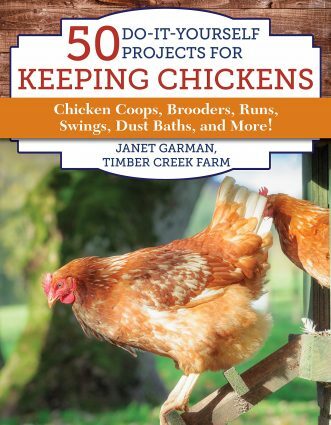 I poured a lot of Do it Yourself Information and detailed step by step projects into my book, 50 Do it Yourself Projects for Keeping Chickens (skyhorse publishing 2018) You can grab a copy through local bookstores, Tractor Supply stores, Other garden and farm supply stores, and through my website. Last year I finally made our family the Christmas stocking I always wanted them to have. Each member of the family received a new Christmas stocking that was handmade and personally styled for them. The Christmas stockings all coordinated. The Christmas stocking pattern I used was easy to follow and each one worked up quickly. With our family growing, marrying and bringing on the next generation, I was happy to have a plan in place to make future family members a Christmas stocking, too. My inspiration for this project originally came from Angi over at Schneiderpeeps. 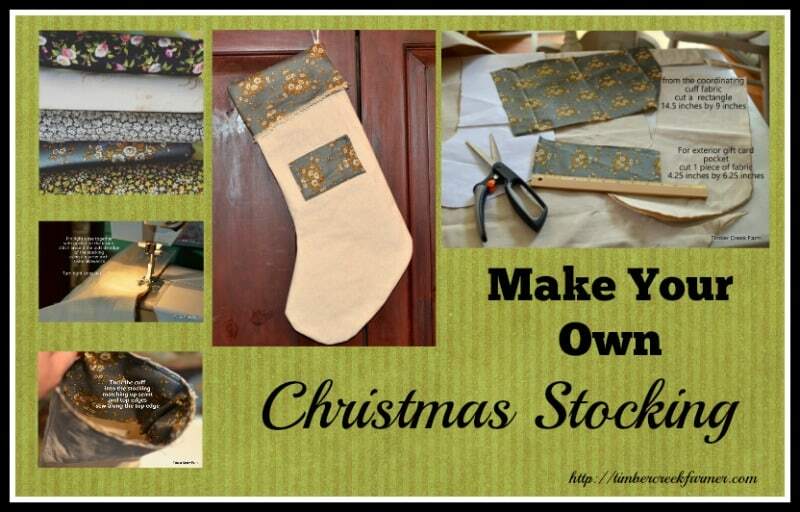 Last year she posted this DIY tutorial about making a new Christmas stocking for each member of her family. 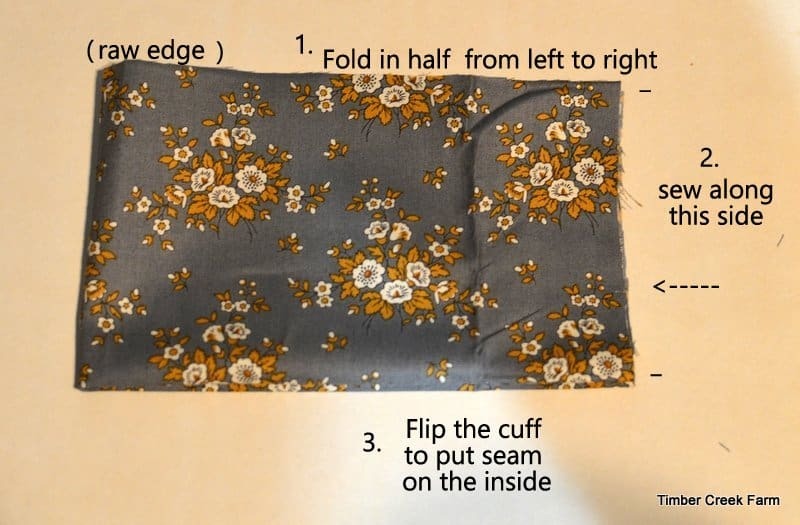 This year I had the opportunity to test sew with some new fabrics from the Andover Fabrics Collection. 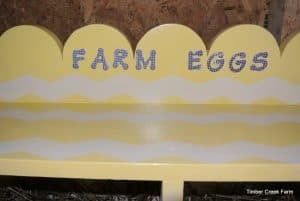 The new designs are inspired by the Little House on the Prairie books by Laura Ingalls Wilder and the popular television show based on the books. I received a sampler pack of fat quarters and instructions to let my creativity run free! 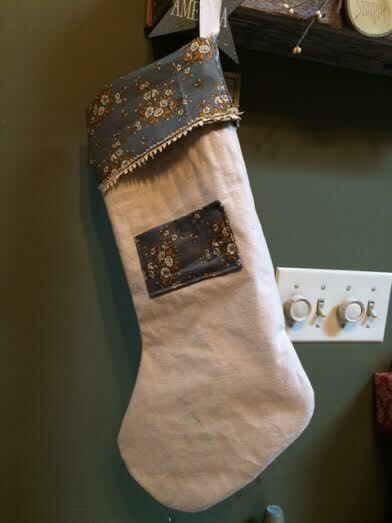 The first project that came to mind was the homestead style Christmas stocking that I made last year. 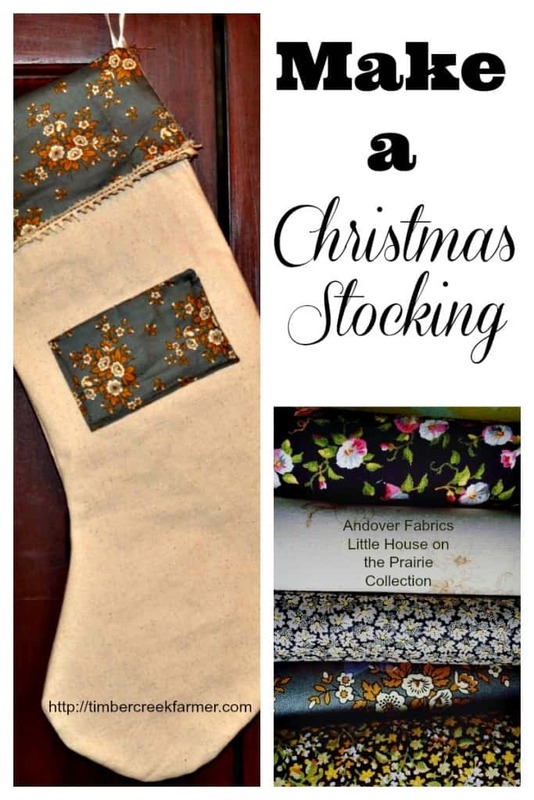 I thought it would be great to see how the Little House on the Prairie fabrics looked as the accents for the Christmas stocking. The directions follow and please feel free to use your own creativity and ideas to adapt my Christmas stocking plan to meet your style and needs. I didn’t have a paper pattern of my own, but I did base mine on the link from Schneiderpeeps. You can find it here. 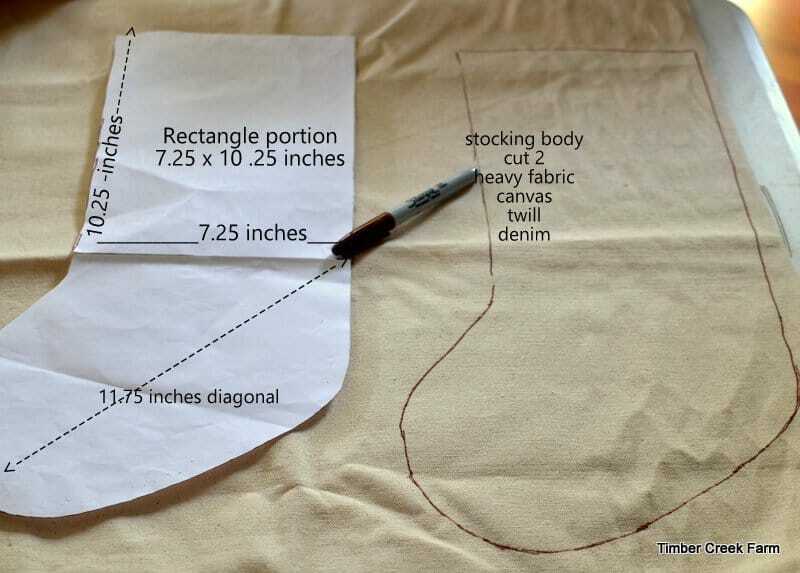 If you have a favorite stocking already, you can trace the shape of the stocking onto sturdy paper to make your own pattern. After you make your Christmas stocking, there is fabric left to make a small soft toy, pin cushion, quilted coaster, or small hot pad. I am sure you can come up with your own ideas, too. And remember to save the scraps, just like Ma Ingalls would have done. 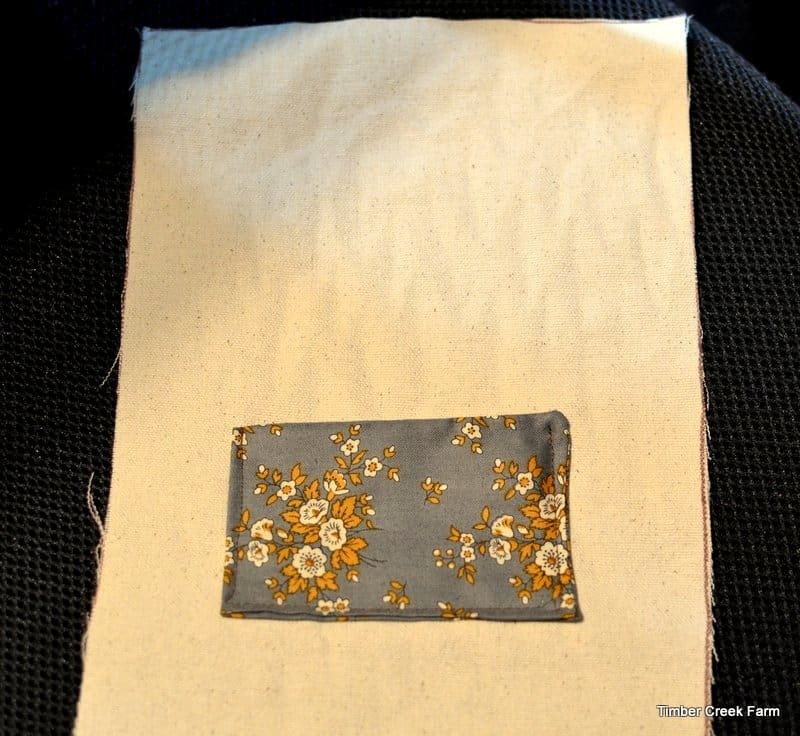 Future quilts can have a patch in them using the same fabric that you used to style your Christmas stocking. Canvas fabric. 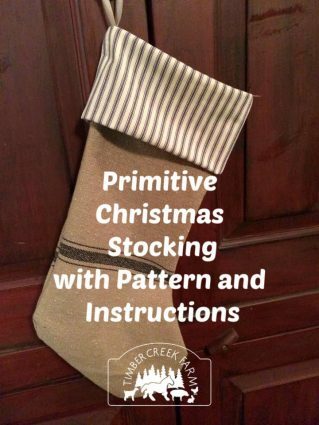 I purchased mine at the home improvement store (canvas drop cloth ) because it was economical and there is plenty to make as many stockings as I need. Cut out the Christmas stocking and the cuff pieces. The outside pocket is optional but can be used to hold a gift card or cash. 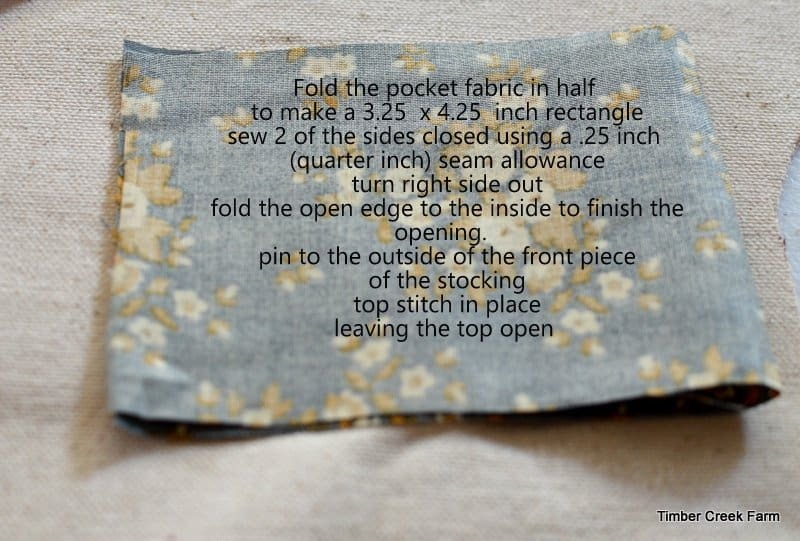 Sew the fabric pocket onto the front of one of the stocking pieces. 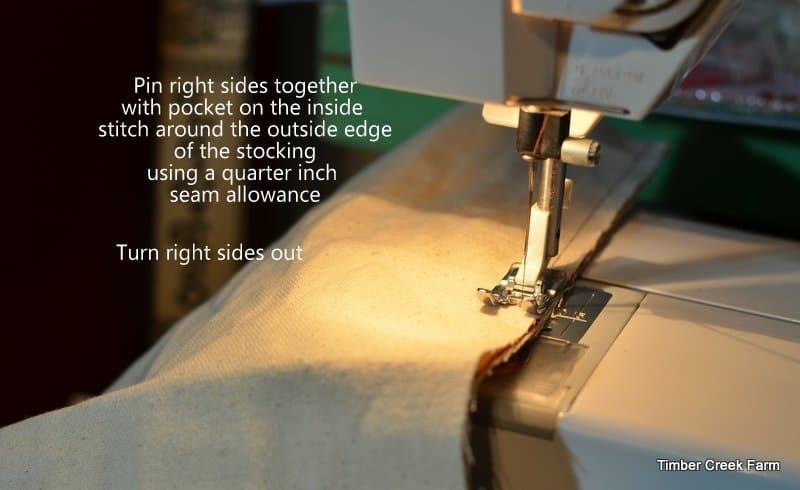 Sew around the outside of the stocking, right sides together, leaving the top open. 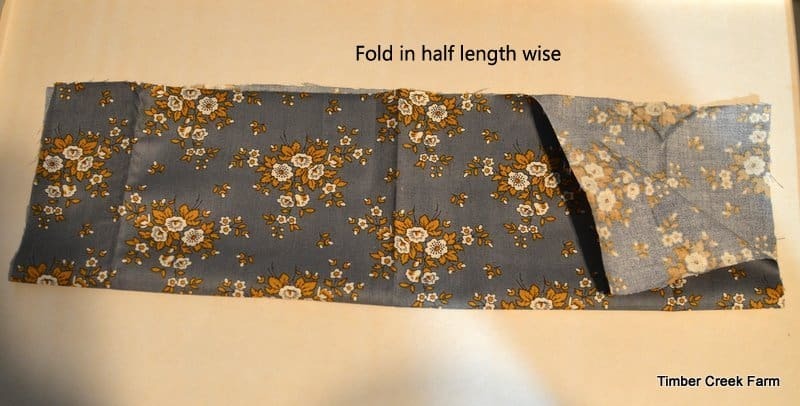 Fold as shown in the picture. 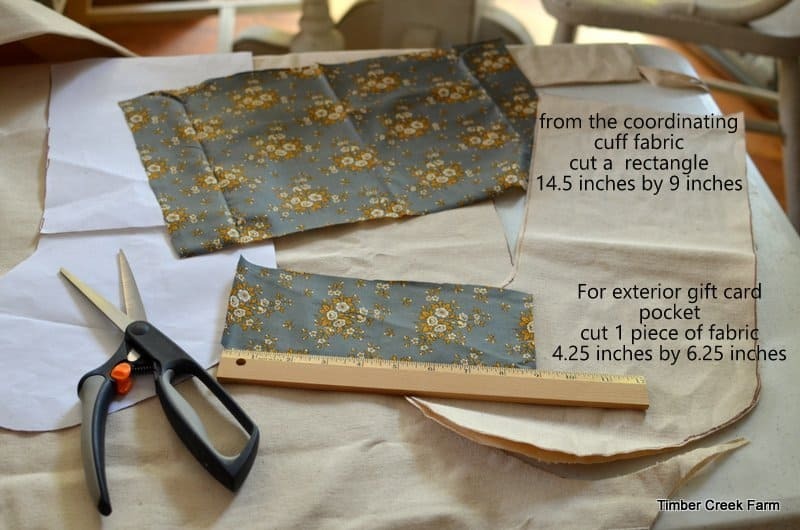 Sew the cuff seam and flip the cuff right side out. 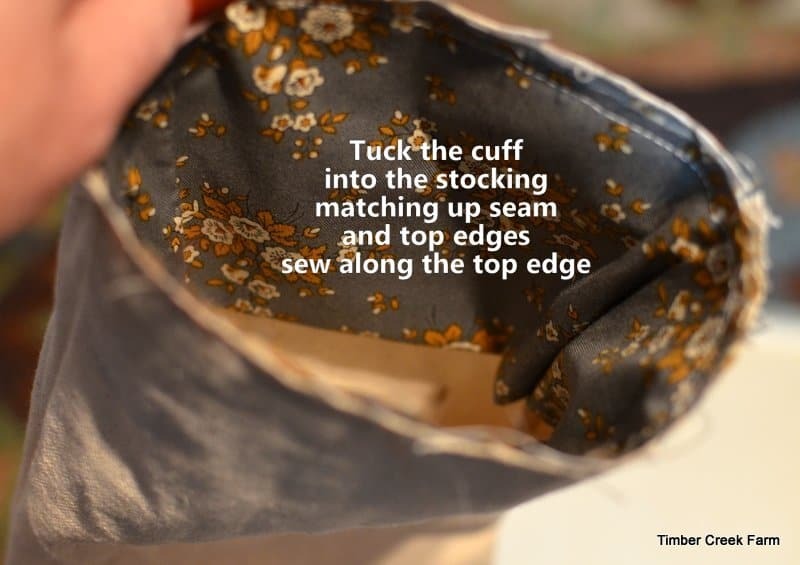 Tuck the cuff into the top of the stocking. 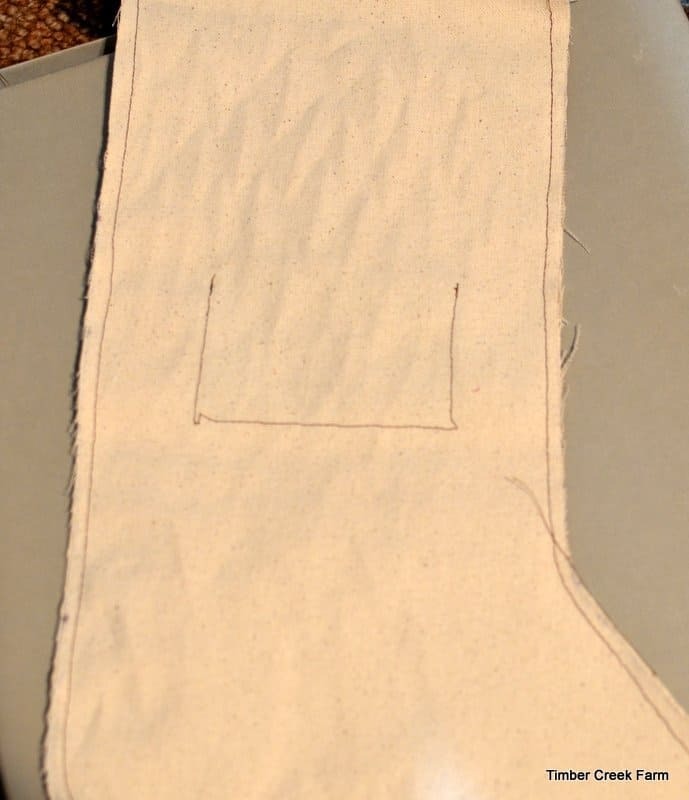 Match the seam to a side seam and align the tops. 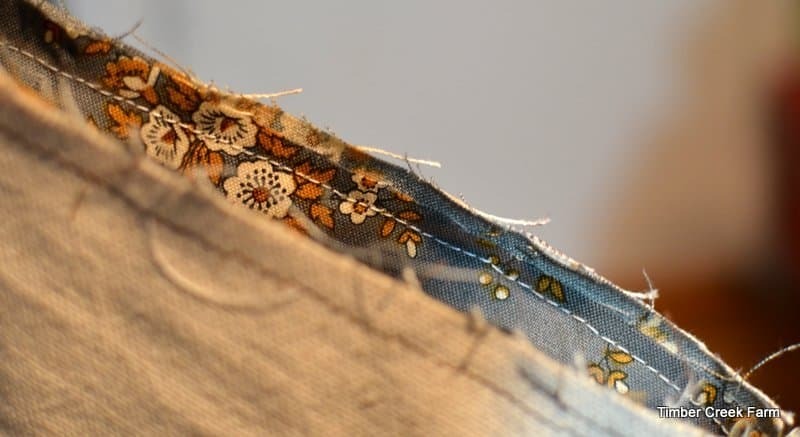 Stitch the top, using a quarter inch seam. 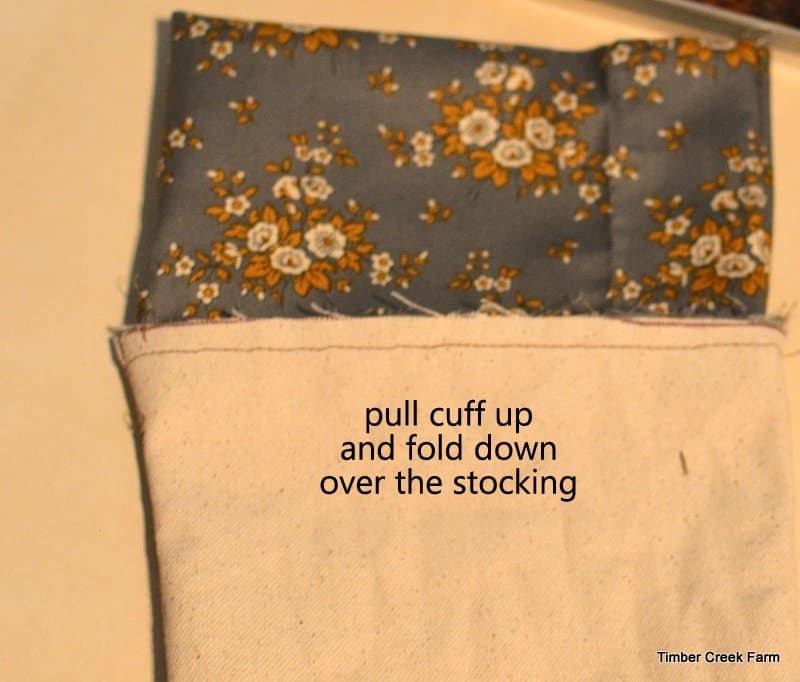 Pull the cuff up and over the top of the stocking. Attach a piece of ribbon, rope, twine or what ever you want to hang your stocking from, to the back seam of the stocking. 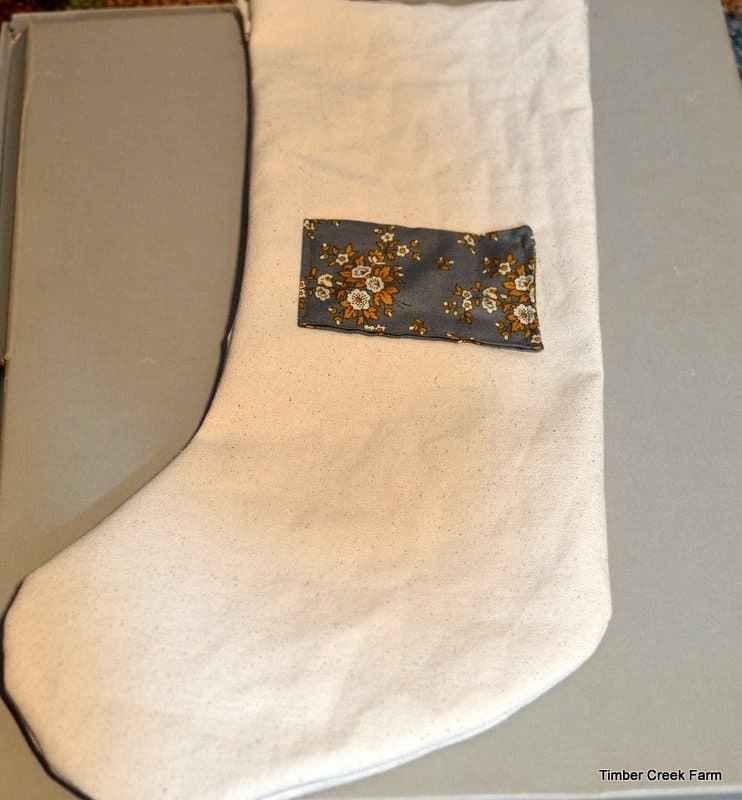 I hope you are inspired to make your own handmade stockings and gifts this season. As our family grows, I am finding it easier to fill a Christmas stocking with small gifts, tasty treats and gift cards than to shop for many larger gifts. This adds a handmade touch to our Christmas celebration. When I see small items throughout the year that a family member might enjoy, it is easy to purchase it or make it then and store it for later. 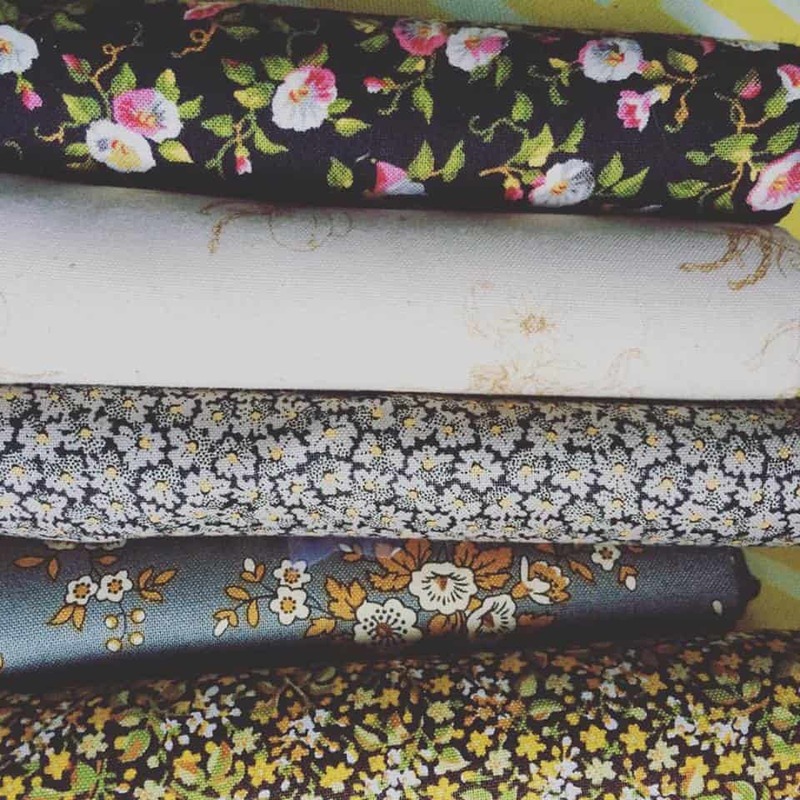 If you are wondering where to purchase the Little House on the Prairie Collection from Andover Fabrics, they have this convenient shopping locator here. Interested in purchasing copies of Laura Ingalls Wilder’s endearing series of books about growing up in a homesteading/farming family? Chris, from Joybilee Farm used the fat quarters to make a patchwork pillow cover with an embroidered front panel. It is beautiful! Here we are down to the wire on the Christmas preparations. I bet most of us still need easy gift wrap ideas. If you run out of wrapping paper are you really going to want to run out to the store at this point? 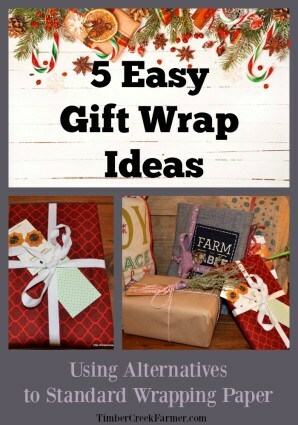 Have you seen any easy alternative gift wrap ideas? What if the thought of all that wrapping paper, that can’t be composted or burned, piling up in your living room is too much to bear? When wrapping gifts I love to think outside the norm and I like the packaging to add value to the gift. Let me share some of my ideas with you. I am sure you will be able to add your own ideas after you get started with these easy alternative gift wrap ideas. Wrap books in something related to the subject of the book. For example, use a pretty new dish towel as the “wrapping paper”gift wrap for cookbooks . The cooking section of the newspaper would be a another great idea. Use twine for the ribbon and tie on a couple of napkin rings for added impact. If you have children who want to help, let them cut out food pictures from magazines to glue to the newspaper wrappings. For a sports theme book, use the sports section. A novel could be wrapped in the book review section. You get the idea? Here’s a list of a few more recycled paper ideas for gift wrap. 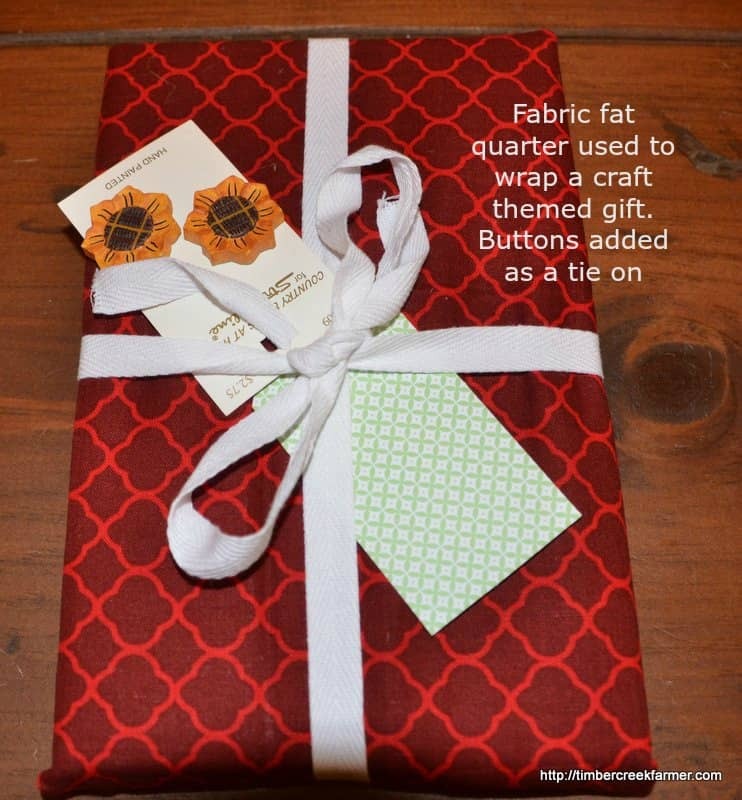 Use a fat quarter of quilting fabric to wrap up a crafty theme gift. 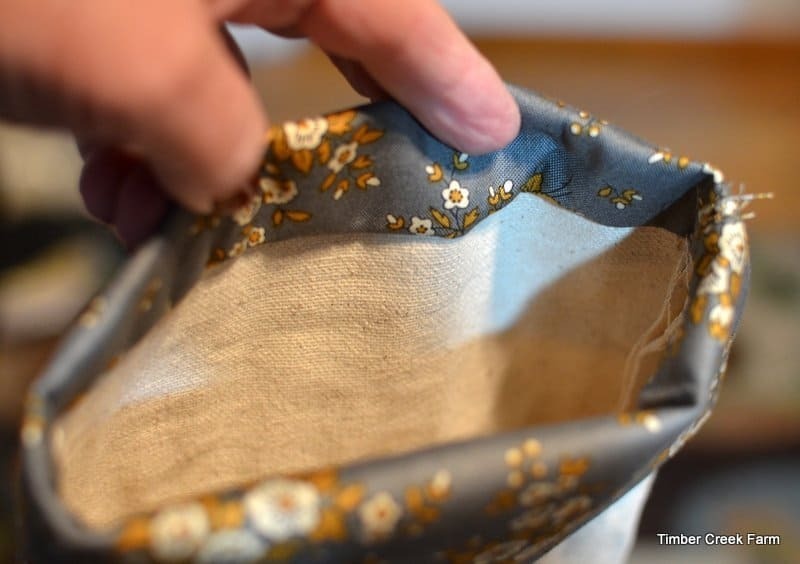 To take it up a notch, tie on a seamstress tape measure, or a package of pretty buttons. Maybe you have some older craft magazines around and could sacrifice some pages to use as wrapping paper. Or skip the wrap altogether and use a storage container or cute tote bag to hold the gift. Crafters and makers always need more storage. 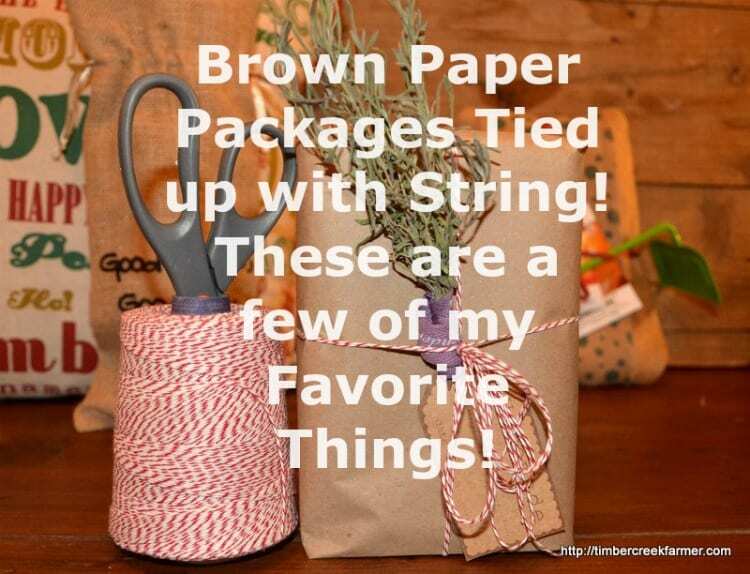 Wrap up the gift in a piece of burlap. Tie on a handmade ornament made from natural items or herbal sprigs. If you use gardening twine to tie it all up, the whole gift can end up in the garden next spring. Grab a fashion magazine from the recycle bin and add some fashionable clothing pictures to the plain wrapping paper. Decorate an unneeded shoe box to use as a gift box. 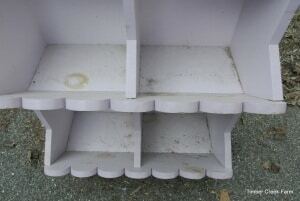 The box can later be used to store other items. 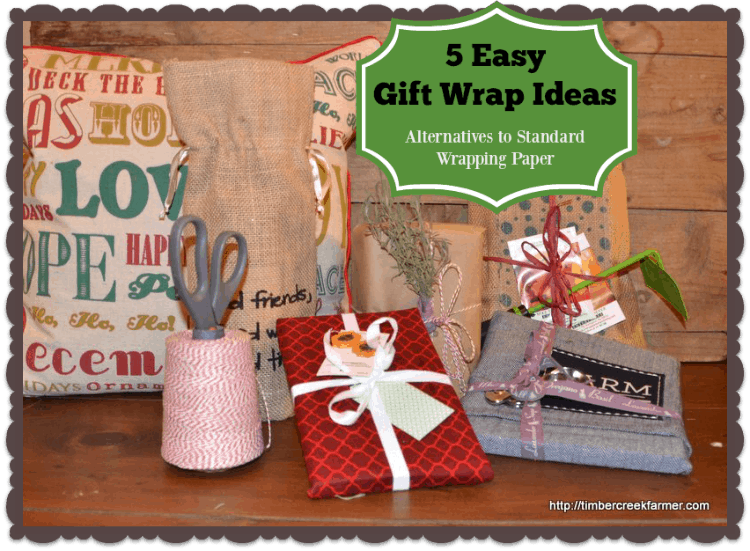 I love to give practical gifts from our homestead and wrap them in my favorite paper. Brown paper that comes on a big roll has many uses and I find myself turning to it all year long. The paper is completely safe for recycling. I buy this one and it lasts a long time. 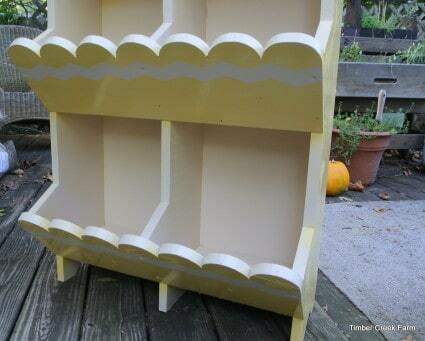 I use it to cover the table for coloring projects with my granddaughters, too. Wrapping gifts in plain brown paper allows me the freedom to write on the paper, decorate however I want, and customize the gift wrap to suit the gift recipient. I use different types of twill ribbon, satin ribbon, rick rack, vintage lace, twine, and raffia for the ribbon. Add on a tree ornament, or something useful, and a pretty tag. I hope these ideas help you wrap up the season in style! Here are some additional articles on the same topic. Self Sustaining Living on our farm means I try to reduce the amount of waste that the farm sends to the landfill. It’s not always easy and I try to think creatively in order to reduce the waste. 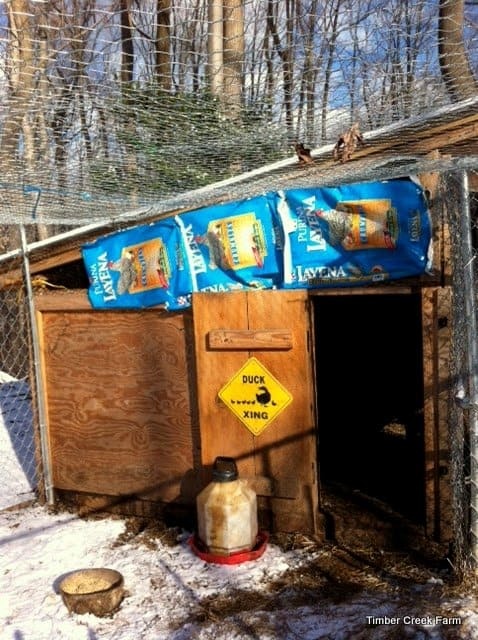 Every week our chicken coop residents eat through two fifty pound bags of feed. Every week that is two poly bags that end up in the refuse pile waiting for trash pickup. The longer we farm, the more conscious I am of how much waste we produce. 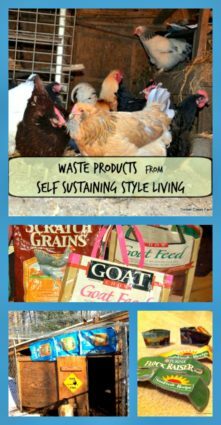 I doubt I will ever get it down to zero, but if I can continually reduce the amount of stuff that comes from our homestead and goes to a landfill, I will be satisfied that I tried my best. Some things we naturally have always used at least twice before it heads to it’s final destiny. Although newspapers are recyclable, I normally use them again to line the rabbit hutch floor, or the chick brooder in the spring. 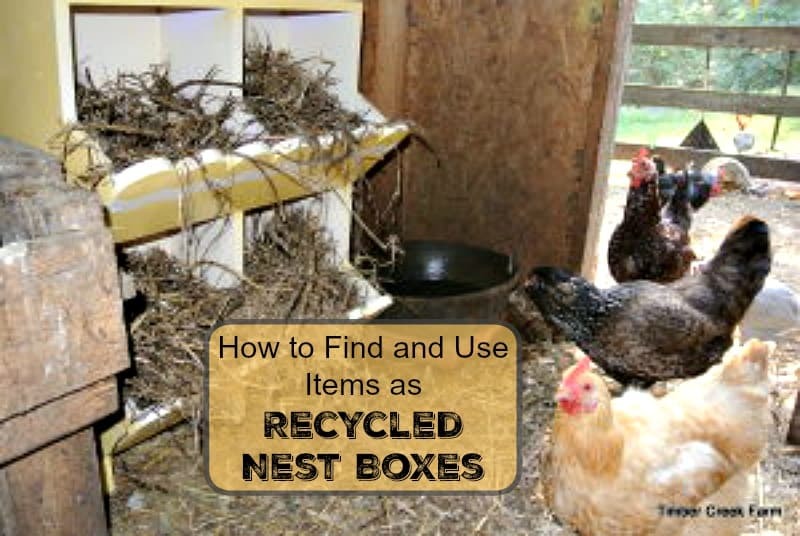 Cardboard boxes usually are recycled through the chicken coop as a nest box or hiding spot for smaller chickens. And then there is the issue of all those poly bags that are now the way chicken feed is sold. Two bags a week, fifty two weeks per year, 104 feed bags total and that is just from the chicken feed! 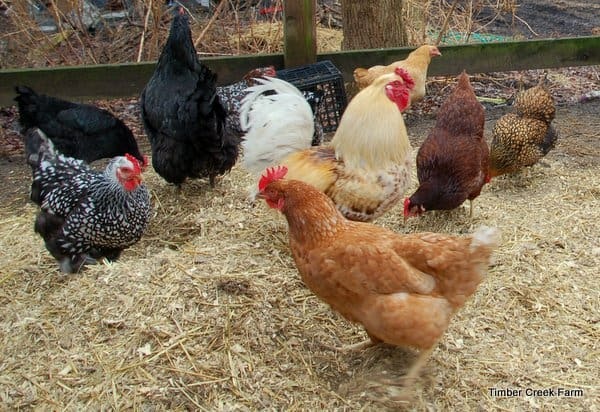 Extra tidbit > there are over 19 billion chickens in the world! For more fun facts on chickens check this post. That’s a lot of chickens and waste from chickens! I see the pile of feed bags accumulate every week on our farm and it bothers me to send them to the landfill. Coming up with some additional uses was fun and creative. Basically, many of the uses you have for a purchased vinyl tarp can be replaced by using an empty poly vinyl feedbag. Tote bags and reusable shopping bags – Take these to the grocery store, library, any place that uses those tiny annoying plastic shopping bags that only hold three items. 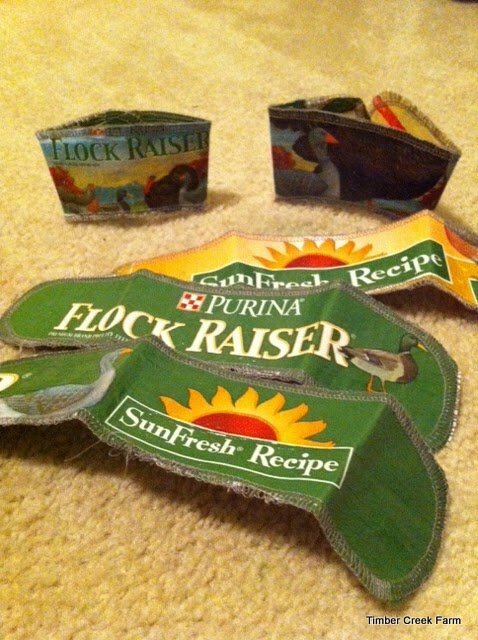 Reuse the empty feed bags as trash bags, instead of garbage bags. We always have an empty feed bag propped up in our feed room. We use it to collect the tops from the feed bags, and any other trash. Use the poly fabric feed sack as you would any wipe clean fabric. 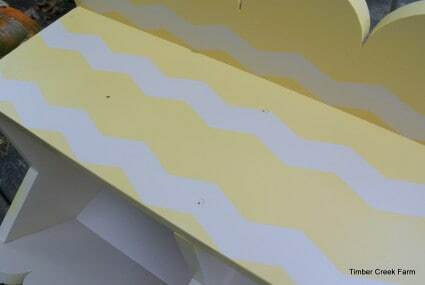 Make place mats, coasters, stadium seats, covers for patio furniture cushions. Around the farm or barnyard, reuse the feed sacks to line the nest boxes for ease of cleaning. I also use the bags to cover open windows for storm protection, or to cover the duck house open space at the top during the coldest part of winter. We do the same with the top parts of the rabbit house too. The large wire covered “windows” are great for summer ventilation but leave too much space for cold winds during winter. Using Poly Feed Bags for other Animal Housing. In our rabbit hutch with runs we use the feed bags under a few inches of dirt and mulch or bedding. The poly vinyl bags help protect the wooden floor in the hutch. In the run, having the old chicken feed sacks under the dirt, keeps the rabbits from digging out under the fencing. 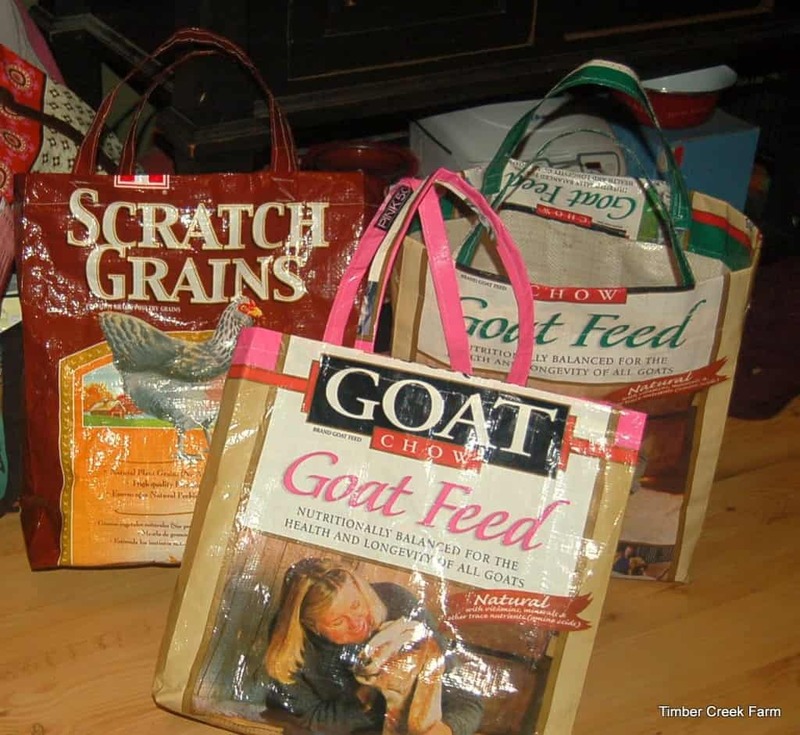 I haven’t thought of any ways to reuse the poly vinyl feed sack with any activities for the sheep and goats, but give me some time to think about it! At the end of the day, the important thought is that we should be aware of what we use and throw away. Even if you are being careful about how much you consume and throw away, there is waste. 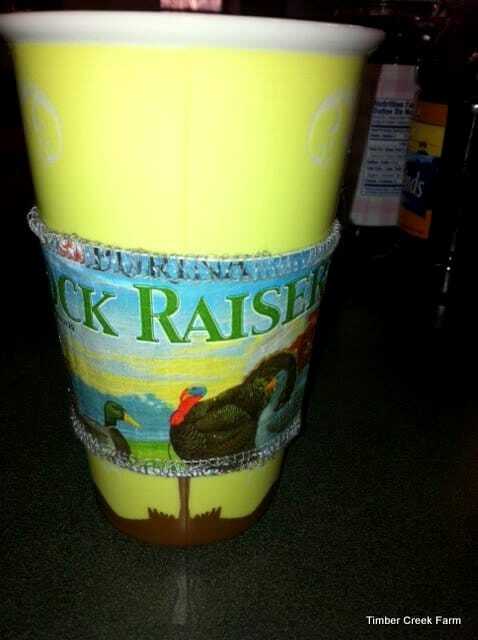 Thinking about the waste products and coming up with a way to replace another item with something recycled from the poly vinyl feed bags will help keep some trash out of the landfills. 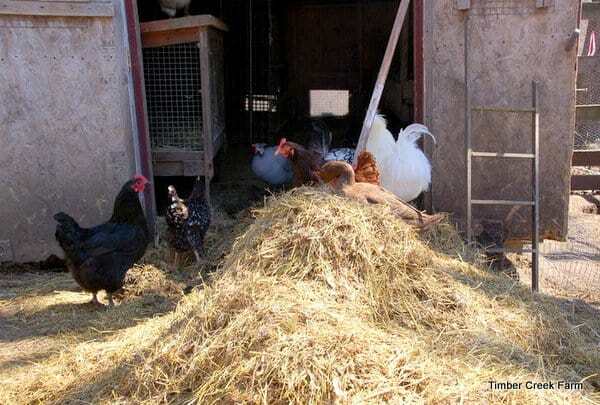 Making sure we are responsibly caring for the coop manure and used bedding is very important. Not only cleaning the coop out regularly, but turning the waste into dark healthy compost is the healthy way to control the waste. After a year, the compost added to soil will provide nitrogen and other nutrients to the soil in your garden. 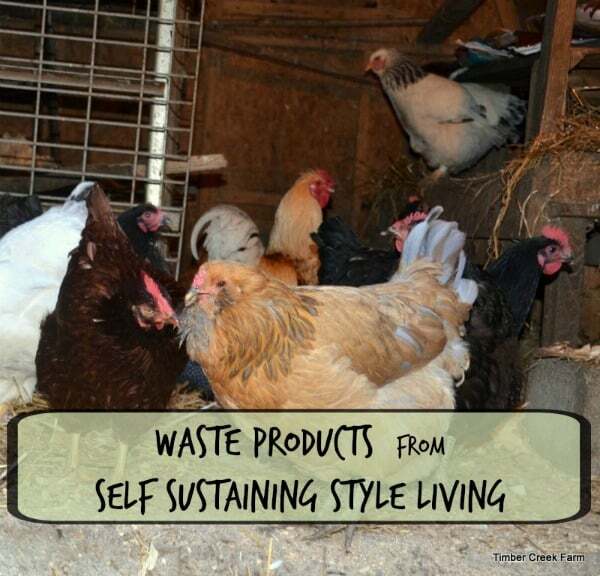 What products do you reuse from the coop, to help control the amount of waste that heads to our landfills? Share you experiences with farm style, self sustaining living in the comments.